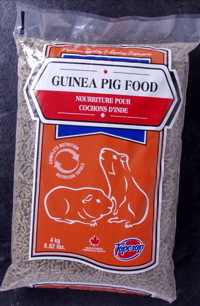 Topcrop Guinea Pig Food has been formulated as a 100% complete and balanced diet for all adult Guinea Pigs. Your pet should be fed free choice, that is access to food at all times, from a clean, dry bowl that is either in the cage or in a through the wall feeder that can be filled from outside the pets home. Always maintain a fresh supply of water that is accessible continuously. Should your pets food become contaminated with urine, droppings or water, discard the soiled food, wash out and dry the dish and replace with a fresh supply. Although supplementation is not necessary, you may want to occasionally give your Guinea Pig a treat, such as a seed stick, carrot, or one of many other prepared treats on the market. Guinea Pigs have very specific dietary requirements and should only be fed food specifically formulated for them. Feeding food intended for other animals may result in severe health consequences. In their natural habitat Guinea Pigs like to burrow and chew, so the environment you provide should accommodate this as much as possible. Clean your Guinea Pigs cage out on a regular basis so the it always has fresh bedding. When taking your animal out of its habitat for any reason, never leave it unattended, as rodents that get loose may suffer serious repercussions from incidents that stem from leaving them unsupervised when not securely in their home. Grass clippings and other leafy materials not intended for human consumption may contain pesticides and should not be fed to your pet as they may have a detrimental effect on its health. Wheat and Wheat by-products, Dehydrated Alfalfa, Barley, Oats, Soy Hulls (a source of fibre), Soybean Meal, Molasses, Calcium Lignisol Sulphate (a binding agent), Dicalcium Phosphate, Calcium Carbonate, Sodium, DL-Methionine, Vitamin A, Calcium Iodate, Vitamin D#, Manganese Oxide, Vitamin E, Sodium Selenite, Pantothenic Acid, Copper Sulphate, Folic Acid, Zinc Oxide, Niacin, Ferrous Sulphate, Thiamine Mononitrate, Pyridoxine Hydrochloride, Vitamin B12, Biotin, Riboflavin, Ascorbic Acid (Vitamin C), Menadione.